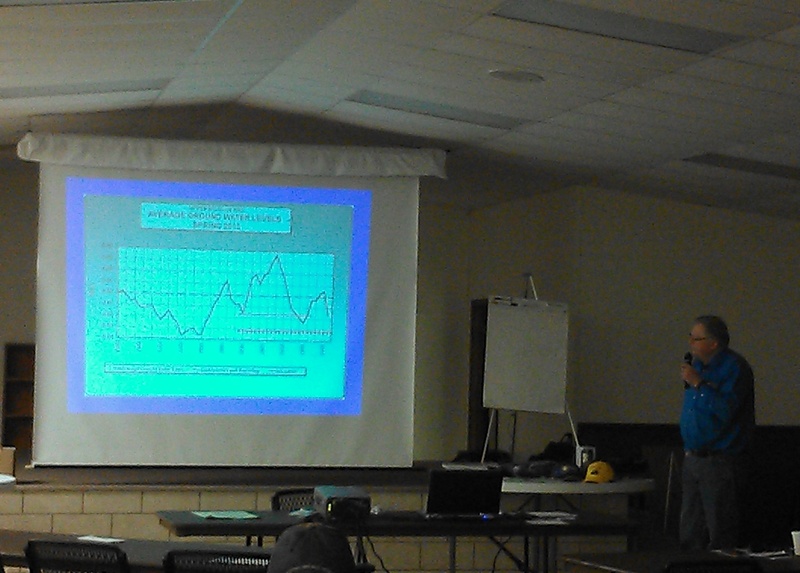 Rod DeBuhr with the Upper Big Blue NRD spoke at a few meetings recently. He shared there’s a lot of rumors floating around, but if you have questions, please just ask the NRD. There will be no well drilling moratorium and no restriction on adding new acres in the District. The only exception to this is if the allocation trigger is reached, there will be no new transfers. The UBBNRD encompasses 1.2 million irrigated acres and 57% of the water is used on only 29% of the acres; thus there’s still some inefficiencies within some producers’ operations. These are producers using, on average, more than 8” since 2007. The average water use since 2007 is just under 8” for the District. Rod DeBuhr from Upper Big Blue NRD speaks at the Hamilton Co. Ag Day in Aurora. Flow meters are required on all wells by January 1, 2016 or by when an allocation is triggered-whichever comes first. The first allocation period is 30” of water for 3 years. They will then evaluate where the water levels are. If recovery doesn’t happen after the three years, then there will be a second allocation of 45” for 5 years. For flow meter specifications: all new meters must record in acre-inches. They must also have an anti-reverse feature on them. They must be installed based on the manufacturer recommendations-no exceptions. Existing meters are grandfathered if they are determined to be accurate. There is no cost share on new meters, but there is some cost share for repairing old meters. 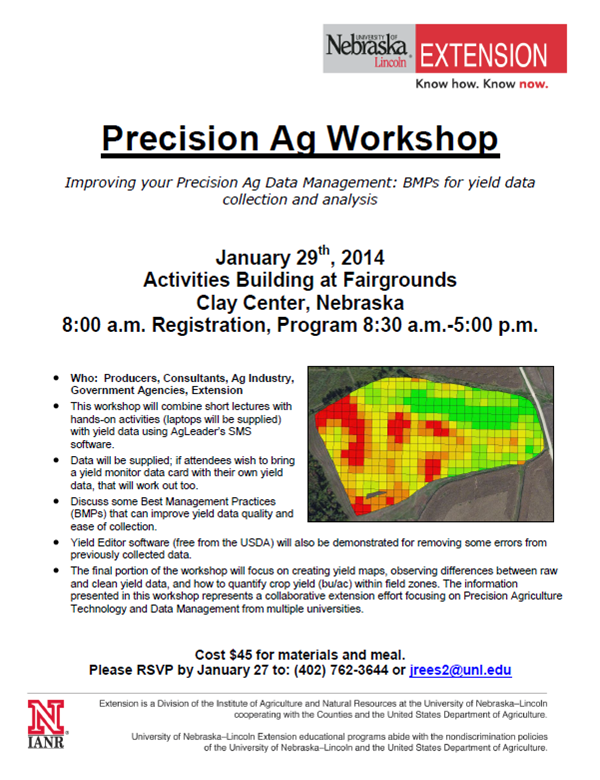 Please contact the UBBNRD at (402) 362-6601 for questions or more information. 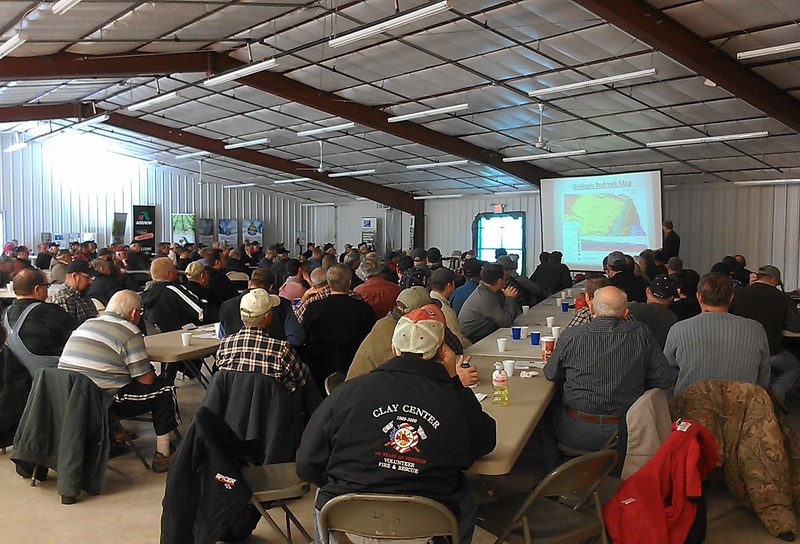 Little Blue NRD updates during the Soil and Water Conference in Clay Center. Daryl Andersen with the Little Blue NRD also shared some information with me. These rules are effective as of January 17, 2014, which were put in place in 2006 or sooner. For well constructions and flow meter requirements as of Mar. 2006, new or replacement water wells to be used for domestic, stock, or other such purposes shall be constructed to such a depth that they are less likely to be affected by seasonal water level declines caused by other water wells in the same area. Any new irrigation well or water wells for all other uses except municipal, domestic, public water supply, or livestock are required to have a minimum of 10 times the pipe diameter of clear space in the discharge pipe to allow for potential installation of a flow meter at a future date. There are some exceptions if a new meter is installed during the time of well completion; please contact the LBNRD at (402) 364-2145 for further info. Spacing between all new irrigation wells should be set at 1000 feet. For the Clay/Nuckolls Water Quality Sub-Area: Two new rules were enacted March 1st, 2013 along with all of the prior rules. First, water samples need to be collected from all high capacity wells by the producer, delivered to LBNRD and NRD will analyze it for nitrates for 2013 and 2014 growing season. Second, water pumpage report is required from all wells for all producers in 2013 and 2014. Report can be hour meters, flow meters or other devices. Please contact the LBNRD for additional questions. 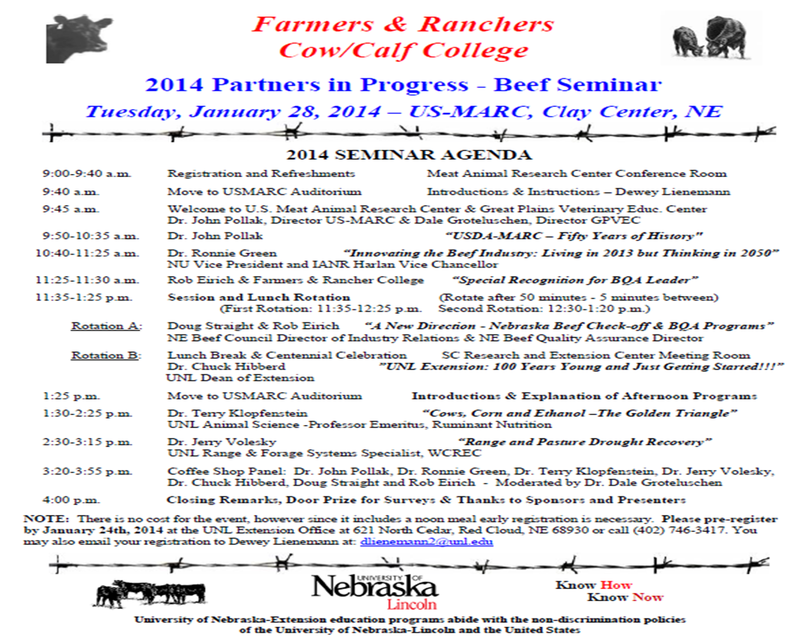 This looks like an excellent workshop for anyone in cow-calf production. Hope to see you there! (Click on the agenda below to enlarge the view). Great Fun Fact Friday from Dr. Lindsay Chichester on fistulated steers! At UNL we have several fistulated steers which are used for research and education. Traditionally, these fistulas (also called a cannula) were inserted for research purposes. The fistula can either be on their neck (esophageal fistula) to monitor what they eat, especially when grazing to determine grazing and forage preferences OR it can be on their left side, which goes into the rumen, the largest compartment of their stomach to monitor feed and diets, ultimately making livestock rations more efficient. I talk more about ruminants (livestock with one stomach which has four compartments) here. But today I want to introduce you to the UNL Mobile Beef Lab! 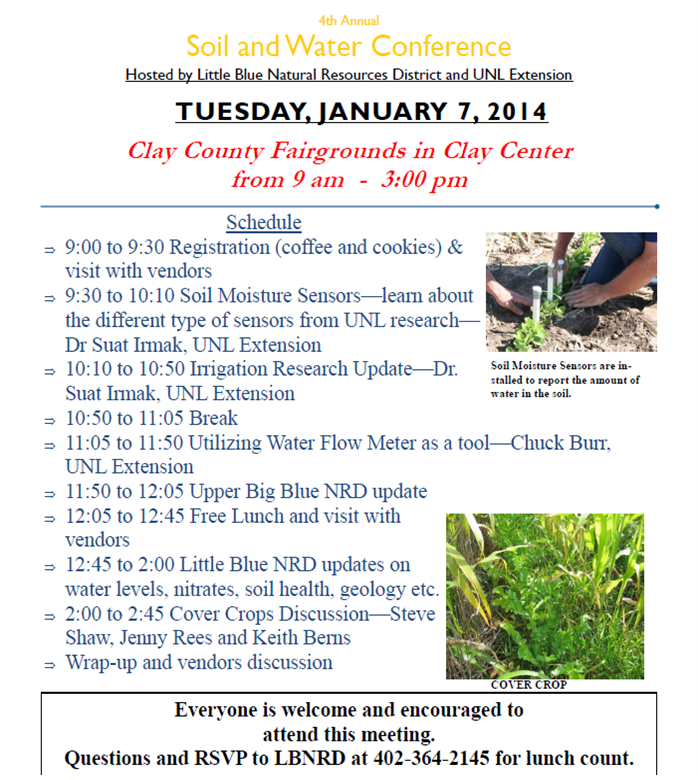 Hope you can join us for our Soil and Water Conference tomorrow in Clay Center!